Jesse’s recently challenge is beets. He thinks they taste like dirt, no matter how he prepares them. This is what people mean when they describe them as “earthy”. Earthy means dirt. Roasting beets often brings out the “earthiness” whereas other preparations, like steaming or pickling, bring out the sweeter, fruiter flavor of the vegetable. 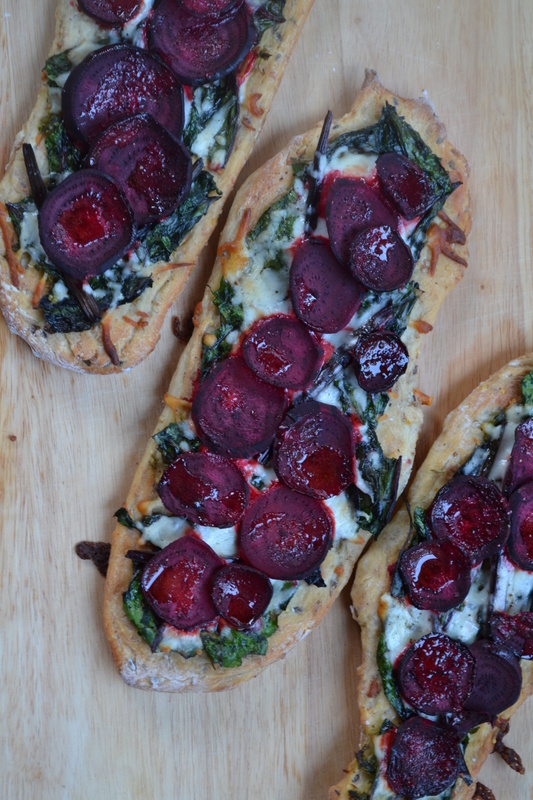 This beet flatbread, which utilizes the entire beet, root to stem, does not taste like dirt. The beets are technically roasted, yes, but thinly sliced and pared with cheese and bread. Even actual dirt would taste good under those conditions! 4 servings. Per Serving: $1.48, 465 calories, 14g fat, 80g carbs, 14g protein. Bring 1 ball of store bought pizza dough to room temperature. Preheat oven to 400 degrees Fahrenheit. Peel and thinly slice 3 beets. Chop the greens and stems and sauté in 1 tablespoon olive oil. ce beets. Using ¼ cup of flour, shape dough into flatbreads. Par cook in the oven on tin foil greased with cooking spray for 10 minutes, flipping halfway through. Top with pesto (optional – I used garlic scape pesto), ¼ cup mozzarella cheese, beet greens, and raw sliced beets. Drizzle with olive oil, salt, and pepper. Bake for 25 minutes. For the past few weeks I’ve had a serious craving for pizza. After a few late night trips to the pizzeria on the corner, I decided to intervene with something a little less greasy and a little more homemade. When I’m making pizza at home, I use premade dough from the bakery or deli section of the grocery store. It comes in a plastic bag (about 22 ounces) and eliminates all of the time it takes to make dough and wait for it to rise. I lucked out when making this recipe and found whole wheat dough, which packs an extra nutritional punch. Hawaiian Pizza can be a hit or miss; you either love the idea of fruit on your pizza or the thought grosses you out. But if you’re brave enough to try it I have a feeling you’ll love it. Instead of using the traditional Canadian bacon for this recipe, I asked for a thick slice of ham at the deli counter. The Canadian bacon was much more expensive and I knew I wouldn’t use the whole package for myself. 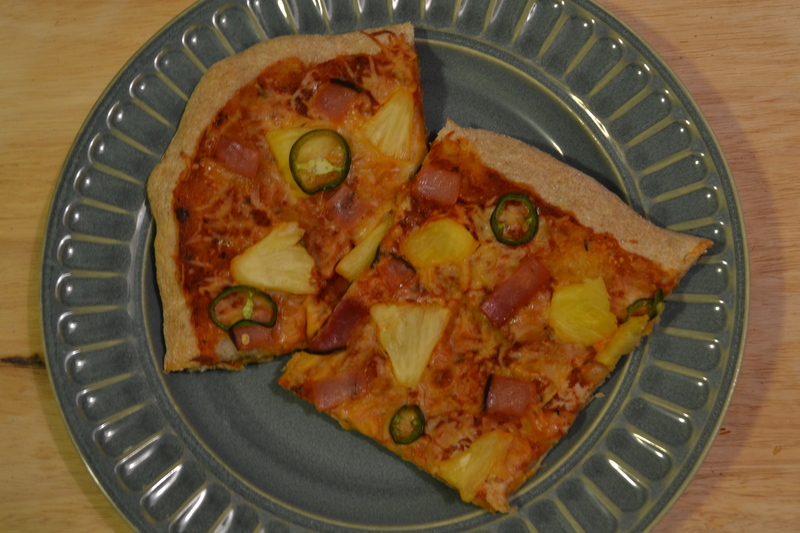 If you already love Hawaiian Pizza, I know you’ll like this made-at-home version. If you’re not on the pineapple-on-your-pizza bandwagon, I hope you give this a try! Preheat oven to 400 degrees Fahrenheit. Cover a cookie sheet with aluminum foil and spray with cooking spray. Sprinkle .5 tablespoon whole wheat flour onto a cutting board. Roll 22 ounces whole wheat dough in the flour, covering the outside until the dough is no longer sticky. Pull and press the dough into a rectangular shape, about the same size as the cookie sheet and about half an inch think. Sprinkle the top with 1 teaspoon cornmeal. (If you don’t already have cornmeal in your pantry, skip that step – it’s a nice addition but not worth buying a whole package of cornmeal!) Place the dough on the cookie sheet, with the cornmeal side down. Poke the top of the dough with a fork to release air bubbles and bake in the oven for 5 minutes. While the dough is pre-cooking, thinly slice 1/3 cup pineapple and 1 medium jalapeno. Dice 1 thickly sliced piece of deli ham (about .1 pounds) into inch long strips. Remove dough from the over and top with ¾ cup tomato sauce, ¾ cup mozzarella cheese, and the pineapple, jalapeno, and ham. Place the pizza back in the oven and cook for 15 minutes, or until the cheese is melted and bubbly. Yield: 4 servings. Per Serving: $1.71, 481 calories, 13g fat, 76g carbs, 18.5g protein.